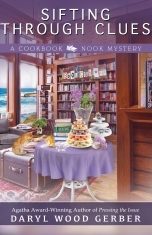 Daryl Wood Gerber is the Agatha Award-winning, nationally bestselling author of the French Bistro Mysteries, featuring a bistro owner in Napa Valley, as well as the Cookbook Nook Mysteries, featuring an admitted foodie and owner of a cookbook store in Crystal Cove, California. 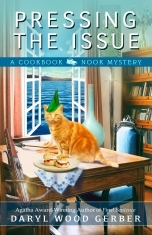 Under the pen name Avery Aames, Daryl writes the Cheese Shop Mysteries, featuring a cheese shop owner in Providence, Ohio. As a girl, Daryl considered becoming a writer, but she was dissuaded by a seventh-grade teacher. It wasn’t until she was in her twenties that she had the temerity to try her hand at writing again . . . for TV and screen. Why? Because she was an actress in Hollywood. A fun tidbit for mystery buffs: Daryl co-starred on Murder, She Wrote as well as other TV shows. As a writer, she created the format for the popular sitcom Out of This World. 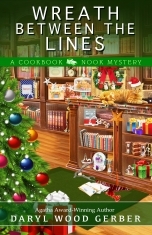 When she moved across the country with her husband, she returned to writing what she loved to read: mysteries and thrillers. Daryl is originally from the Bay Area and graduated from Stanford University. She loves to cook, read, golf, swim, and garden. She also likes adventure and has been known to jump out of a perfectly good airplane. Here are a few of Daryl’s lifelong mottos: perseverance will out; believe you can; never give up. She hopes they will become yours, as well. To learn more about Daryl, visit her website at DarylWoodGerber.com.